As Brazil’s left-wing president, Dilma Rousseff, has been suspended from office to face trial for disregarding budget laws, details have emerged on key figures involved in what Rousseff supporters are calling a coup, hinting at a covert plot involving Washington. While Latin America’s modern history is riddled with well-documented examples of US operations aimed at overthrowing regimes, some would argue the situation in Brazil is tied to a popular protest movement that has sprang up due to the corruption scandal and slumping economy. However, profiles of those at the center of current events offer clues as to why Washington’s hand might be at play. After it emerged that Rousseff’s old ally and former vice-president, Michel Temer, would succeed her as an interim head of the country, the murky details from his past have emerged on Wikileaks. The whistleblowing website said it has published proof Temer served as an embassy informant for Washington. — IN THE NOW (@INTHENOWRT) 16 мая 2016 г. Two cables dated January 11, 2006, and June 21, 2006, obtained by WikiLeaks reveal that Temer, a member of the centrist Brazilian Democratic Movement Party party (PMDB), briefed US diplomats on the political process in Brazil and his party’s aspirations to gain power at the time of 2006 elections, which were won by Luiz Inácio Lula da Silva from the Workers’ Party. Interestingly enough, US consul general in Sao Paolo McMullen, one of the two addressees of the documents marked “sensitive and unclassified,”labeled Temer’s party as an “opportunistic” group with “no ideology or policy framework.” It eventually entered into coalition with the Workers’ Party. 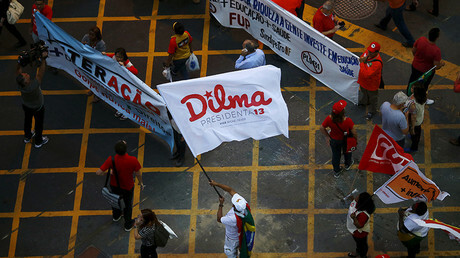 In addition to Temer’s lack of popularity, with his approval rating estimated at around 2 percent, the now-acting president was under investigation for violating election spending rules and faced an 8-year ban to run for any office, according to the Brazil-based US journalist and lawyer Glenn Greenwald. While it might seem that makes Temer an unlikely candidate for Brazil’s highest office, Greenwald alleges that his appointment can serve perhaps not the nation’s, but perhaps some other party’s interests. “He’s planning to appoint Goldman Sachs and IMF [International Monetary Fund] officials to run the economy and otherwise install a totally unrepresentative, neoliberal team,” Greenwald wrote in The Intercept. Senator Aloysio Nunes, of Temer’s Brazilian Democratic Movement, who led Rousseff’s impeachment in the Senate, came to Washington for a three-day visit just a day afterward to meet with US officials. Some of the people Nunes met with included members of the US Senate Foreign Relations Committee, lobbying firm Albright Stonebridge Group, chaired by former Secretary of State Madeleine Albright and a former US ambassador to Brazil, Thomas Shannon, among others, The Intercept reported. Speaking to RT, co-director of the Center for Economic and Policy Research Mark Weisbrot said that Shannon “has been involved in helping other coups in the region,” including in Honduras in 2009 and in Paraguay in 2012. Nunes himself repeatedly spoke in favor of closer relations with the US in an attempt to remedy the espionage scandal between Brazil and the US. Not only the former, but also the current US ambassador to Brazil, Liliana Ayalde, might also boast an experience of taking part in overthrowing foreign governments. — WikiLeaks (@wikileaks) 14 мая 2016 г. Before she was sent to Brazil, Ayalde had served as an ambassador to Paraguay ahead of the 2012 coup, which saw the country’s president Fernando Armindo Lugo Méndez ousted from office through impeachment in a procedure similar to that of Rousseff’s. “That ambassador acted with great force during the coup that happened in Paraguay and she is in Brazil, using the same discourse, arguing that there is a situation that will be resolved by Brazilian institutions,” said Carlos Eduardo Martins, a sociology professor at the University of Sao Paulo, as cited by teleSUR. “I have no doubt that behind this coup is the label ‘made in USA,’” he said. The aim of “powerful oligarchic, media and imperial forces” in the Brazilian political crisis was to get rid of “progressive forces, the popular revolutionary leaderships of the continent,” Maduro said. He described the events in Brazil as “a grave threat for the future stability and peace of all the continent,” expressing concern that the next victim may be Venezuela. — RT (@RT_com) 18 мая 2016 г. 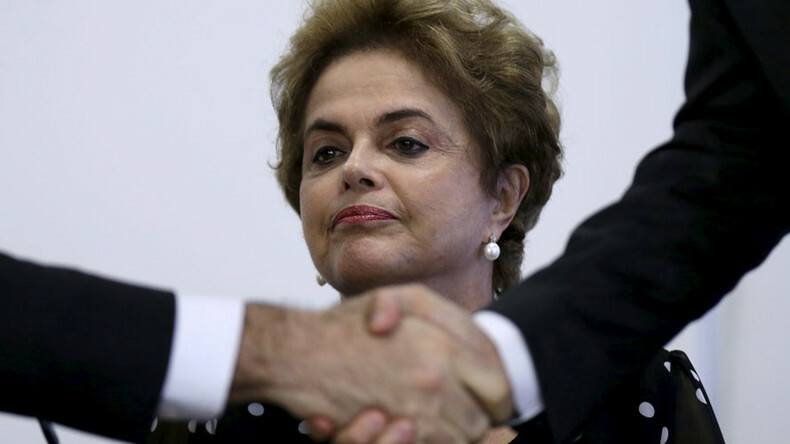 Relations between the US and Rousseff’s cabinet were marred by the scandal that broke out due to the US National Security Agency whistleblower Edward Snowden’s revelations in 2013 that showed that US intelligence was spying on Rousseff by intercepting her communications. The scandal resulted in a cooling of ties, with the Brazilian president cancelling her visit to the US in the wake of the revelations. In 2015, WikiLeaks revealed that the NSA was tapping the cell phones of 29 Brazilian top officials, including Rousseff herself.